Tommy Motswai’s photographic memory owes much to the silences of his world and the racket in his mind, which together give him a right of entry to a strong sense of vision. Born deaf, Motswai hails from Soweto. He enrolled for art classes at FUBA (Federation Union of Black Artists) in 1983 and attended classes at the Johannesburg Art Foundation. He also spent time at the University of Bophutatswana. This experience and exposure have allowed him to sift through the threads of society and come up with a style that undercuts all the loaded expectations about representation and the township eye. The honesty of his work displays a vibrant personality and unprejudiced attitude – one that encompasses his experiences in the broadest sense. In 1992 Motswai won the Standard Bank Young Artist Award, giving him recognition of his work and proving a stepping-stone to greater things. He has a number of solo shows to his name and has been featured in group exhibitions nationally and internationally. He also attended workshops and taught art to deaf children, taking an active role to ensure the recognition of the deaf and advocating the use and knowledge of sign language by both the hearing-impaired as well as other citizens of the country. In the work Happy Mother’s Day “mom (plate 288) Motswai has created a space by using organic forms and has placed the mother in a central role. The mood is contradictory in that it is celebratory whilst at the same time displaying a sense of sadness in the mother’s solitary role. The sarcasm coupled with humour that is apparent in his work sets the artist apart as one whose experience of life is rich and deep; his work is both fresh and engaging. In Meeting hello! Gift, (plate 287), Motswai has depicted a white suburban space and white subjects with apparent ease and avoids an overtly politically-loaded result. His work often demonstrates the interplay of these spaces as a subtle comment on the spatial environments inhabited by South Africa’s various races. His sense of colour is remarkable and his use of line reveals an extraordinary sensitivity that brings his subjects to life. In a recent exhibition held at the Association for Visual Arts (AVA) in Cape Town, Motswai was again able, in his work, to create an atmosphere based on the lightness of his being. This does not, however, render him blind to the social and political aspects of South Africa’s inherent histories; he deals with these directly and entertains at the same time. Born Johannesburg, 1963. Training Largely self-taught as an artist. 1968–1979: Kutlwanong School for the Deaf, where he attended art classes. 1980 onwards: Studied irregularly at the Federated Union of Black Artists (FUBA), as well as with Bill Ainslie at the Johannesburg Art Foundation. 1982–1983: Assistant to the sculptor Kurt Lossgott (b.1941). 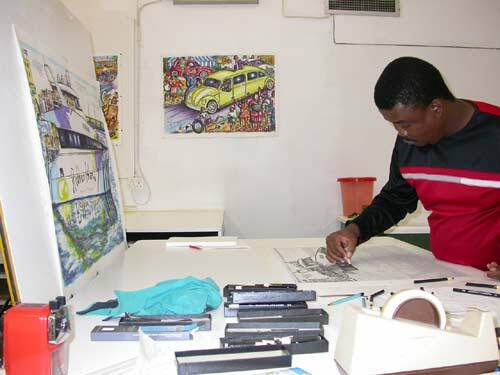 Exhibitions 1993: Standard Bank Young Artist of the Year, Grahamstown and touring nationally. 1988: Solo Exhibition, Goodman Gallery, Johannesburg. 1999: Solo Exhibition, Potchefstroom Museum. Collections Johannesburg Art Gallery; Iziko South African National Gallery, Cape Town; Sasol Art Collection, Johannesburg; Durban Art Gallery; Pretoria Art Museum. Photograph courtesy of Mark Attwood, Artists Press.